Are you sick of sitting in smog-spewing holiday traffic, dodging mall-goers in pursuit of packaged products, and witnessing wanton waste? Don’t despair. There is a way to do good for nature while also doing your “shopping,” even during the glitzy consumerist frenzy that assaults us every December. And here it is: the Center for Biological Diversity’s Greener Giving Guide, updated every year to help you keep up your commitment to endangered species and still bestow meaningful gifts on your loved ones — and letting them share in your dedication to saving the natural world. Happier, greener holidays to you, from all of us at the Center. 1. This year ask for donations instead of presents. If you don’t want others to add to the present-buying hysteria on your behalf, ask your friends to donate what they would’ve spent on your holiday gift to saving endangered species instead. Check out our step-by-step guide outlining how to set a goal and create a fundraiser for the Center for Biological Diversity in under 30 seconds on Facebook. It's a gift to wildlife that gets all your friends involved. 2. Give the gift of helping endangered plants and animals. Wondering what to get that person who has everything? Give the gift that really does keep giving: a Center for Biological Diversity gift membership. It includes a subscription to our action-packed membership newsletter, Endangered Earth; weekly online action opportunities; and special event invitations. This gift will be used to win stronger protections for animals, plants and wildlands worldwide. 3. Give a present that's all about the future. Leave a legacy for our planet by making a bequest to the Center. Ask your attorney or trusted financial advisor to help you find the best type of bequest for your situation (perhaps naming the Center in your will or as a beneficiary in a retirement plan, IRA or charitable trust). Your planned gift will help continue the work of most effective species-focused conservation organization around — the Center, of course! — in protecting animals, plants and wild places for many years to come. 4. Snag the gift of wild love. 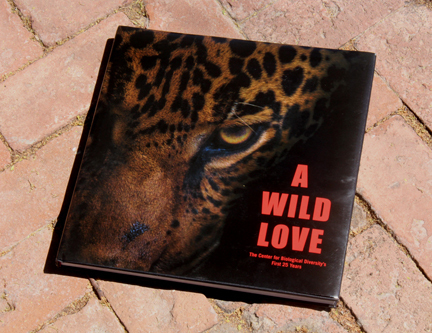 Although the Center's extraordinary 25th anniversary book A Wild Love isn't for sale, we’d love you to have a copy — for yourself or, appropriately, a loved one. Just use our special page to donate and we'll send you a softcover (with a $200 donation) or a hardcover with an inscription by Executive Director Kierán Suckling ($1,000). This unique and elegant coffee-table book features hundreds of breathtaking photographs of many plants, animals and places we've saved since our 1989 launch, plus stirring praise for our work from major publications and conservation heroes like E.O. Wilson and Charles Bowden —and quotes by notable opponents sounding off about our fierceness. Just by using this donation form and getting our book, you’re giving and receiving at the same time — not only giving to the Center, but to the species we protect. 5. Wear your heart on your sleeve by gifting — and wearing — Center apparel. Have a lot of holiday parties to go to? Let your clothes break the ice by wearing a Center for Biological Diversity shirt or hat made of organic cotton and featuring our logo frog, to be found at our online store. The backs of the shirts include a list of many of the species we've worked for, each one of them a conversation topic. Or gift Center gear to get others excited about saving species (if they’re not already). Do you have an idea for going greener this holiday season? Or are you helping support the Center through your work or business? Send us your thoughts and stories at membership@biologicaldiversity.org. Check back regularly, as we’ll be updating this guide until the end of the year.